Colloidal nanocrystals are semiconductor nanoparticles with tunable optical properties from UV to THz. Their luminescence properties have driven the interest for these materials and they are now used as a light source for displays at the industrial level. These nanocrystals are also very promising for optoelectronics because they combine the robustness of inorganic materials with the ease of processing of organic materials. This is particularly true in infrared where current technologies remain expensive and complex. It is in this context that the INSP Physical Chemistry and Surface Dynamics team has chosen to study the (photo) -conduction properties of HgTe colloidal quantum well films, for the design of fast and low-cost devices. 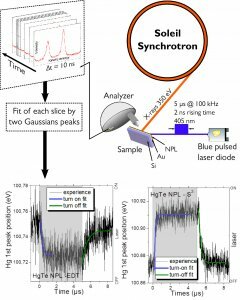 Since conventional techniques based on time-resolved optical measurements are difficult to implement in the infrared range of wavelength, researchers have used time-resolved photoemission and photoconduction to probe the dynamics of carriers in these materials. To reach the infrared wavelengths, it is necessary to use materials with a nartow band gap. HgTe is an ideal candidate because it is a semi-metal under bulk form. As a result the band edge energy observed in the nanocrystals of HgTe purely results from quantum confinement. In this study, the researchers used HgTe colloidal quantum wells (nanoplatelets) recently synthesized by Sandrine Ithurria’s group at ESPCI. The 2D geometry, with control of the thickness at the atomic level, leads to optical properties without inhomogeneous widening (i.e. the ensemble spectrum is the same as that of an individual particle). The challenge is then to make these materials conductive and photoconductive. This is possible by modifying the surface chemistry of the nanoplatelets. 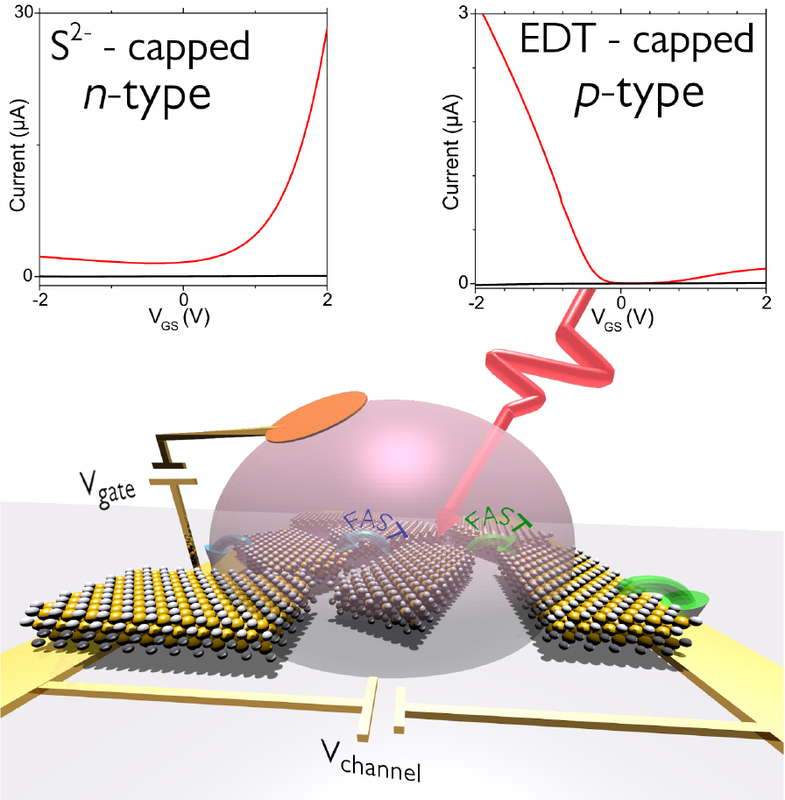 Researchers have demonstrated that modifying the capping surface molecules affect both the interparticle coupling and the carrier density. For this purpose, these nanoplatelets are integrated in an electrolytic transistors (FIG. 1) and the material may be either electron-conducting (n-type) or hole-conducting (p-type) depending on the surface chemistry used. Top part, transfer curves of transistors based on HgTe nanoplatelets, with S2- as surface chemistry (left) or ethanedithiol (right). Below is a scheme of the transistor in which the transport takes place through a nearest neighbor hopping process. The authors have also shown that the photoconduction properties are also governed by the surface chemistry of the nanoplatelets. The p-typematerial is a much better photoconductor, thanks to its Fermi level positioned more deeply in the gap. The response time of these transistors under illumination is of the order of 100 μs to 1 ms. It was then necessary to understand whether this dynamic was an intrinsic performance to the material or was on the contrary determined by parameters related to the device. 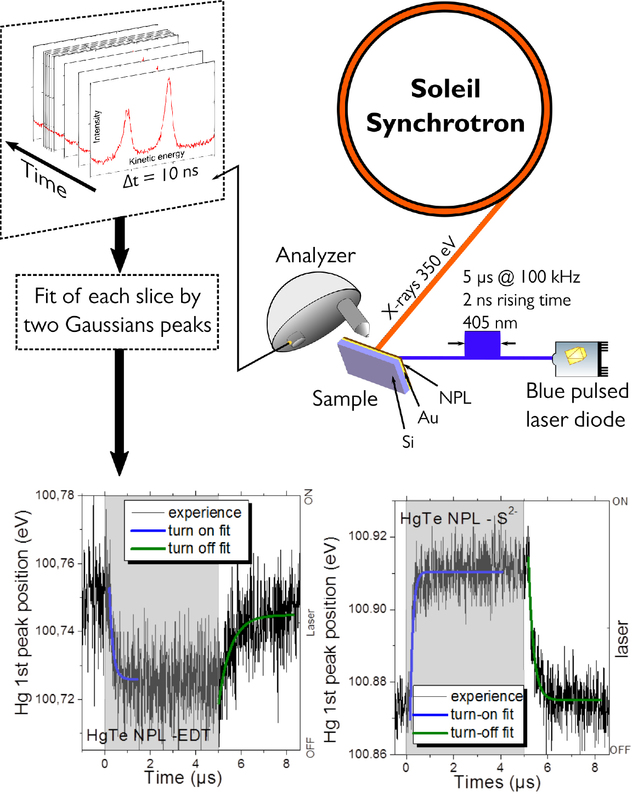 To do this, the researchers used time-resolved photoemission on the Tempo beamline of the Soleil synchrotron. Figure 2 gives a scheme of the experiment. This instrument gives a measure of the relaxation times of the majority and minority carriers. The typical times obtained are in the range of 100ns to 1μs (FIG. 2, bottom part) as a function of the used surface chemistry. 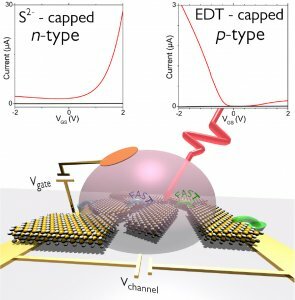 This, suggests that the current response times of the phototransistors can still be reduced by three orders of magnitude by improving the geometry of the devices. Top part, time-resolved photoemission scheme used to determine the relaxation times of majority and minority carriers in colloidal quantum wells of HgTe. Bottom part, the binding energy of the Hg 4f state as a function of time during and after a pulse of light. In conclusion, the researchers studied the photoconductive properties of HgTe nanoplatelets and demonstrated that carrier density can be tuned via surface chemistry. They have also used original techniques to study the relaxation of the carriers in these systems. The obtained results are promising for the design of high bandwidth component (> MHz). The next challenge is to extend this method to narrower band gap materials with optical properties in the mid and far infrared.